The influence of agile principles and practices on the business analysis and application development industry continues to become more and more significant and is impacting the way organizations are running projects, structuring their development operations, and conducting requirements definition and management activities. More and more organizations and BAs are embracing Agile frameworks and techniques as they adapt and improve in order to satisfy the demands of clients and goals of their organizations. The attractive benefits often attributed to Agile (speed to market, adaptiveness to change, the focus on working solutions, continuous and incremental delivery, and increased collaboration and customer satisfaction) has driven many changes in how we have traditionally approached project planning, analysis, design, and development. The impact on Business Analysts has been significant and if we are slow to evolve and adapt we will see our value diminished, the demand for our services reduced, and BA positions and contracts eliminated. So, to be blunt, as a Business Analyst it is essential that you do whatever it takes to remain relevant, valuable and attractive to your employers and clients. The AgileBA Certification has quickly established itself globally as an essential framework and certification that provides many of the answer organizations are search in for regarding agile business analysis. There are certainly other general agile courses (and these are certainly valuable and encouraged), other certifications in various frameworks and for other roles (like Scrum Master or Product Owner) but BAs need specific knowledge and skills for their role. While there are other good courses on Agile Business Analysis (we’ve done all the research,) we recommend the AgileBA program for its practical orientation, its integration with other frameworks (like Scrum) and for its BA-specific Agile certification. 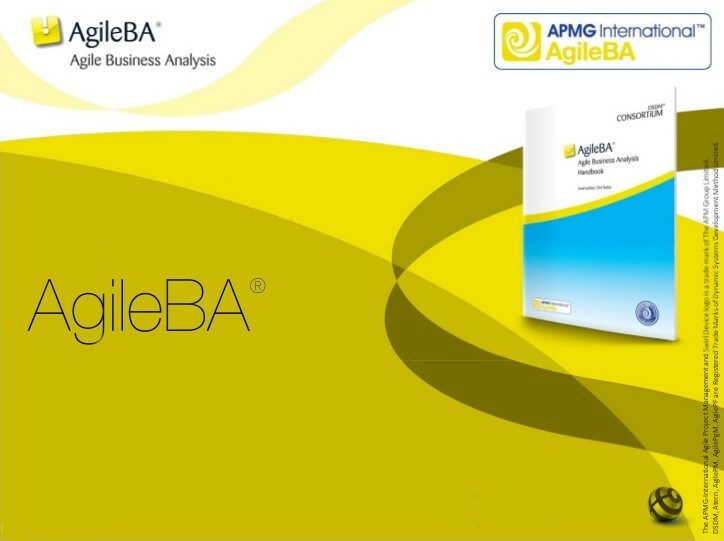 Based on the Agile Business Consortium’s Agile Project Framework, the AgileBA provides clarity in the role, essential principles, practical insights, and specific activities, techniques and practices for Business Analysts involved in Agile. The framework achieves an ideal balance between the “items on the left and the items on the right” allowing Business Analysts to understand how they can be effective and valuable in supporting the values and goals of Agile in a fast paced, collaborative, changing business environment. Understand your role and value as an Agile Business Analyst. Equip yourself with the core principles, concepts, and skills required to support agile efforts – from Scrum to SAFe to XP and DSDM. Learn how to translate agile principles into specific business analysis activities of value. Become an informed and valuable member of the project team using AgileBA practices. Enhance your resume with the AgileBA certification. Join the Agile Business Consortium with a free year’s membership . Do yourself, your employer, and your clients a favor and get certified today. Visit here for details on the AgileBA certification training. View the public course schedule for upcoming Agile classes here. Checkout our complimentary Agile resources from our online library here. Register for the next AgileBA class here.